The hotel is an old house by the sea, lovingly renovated. My room is not that spacious, but it’s warm and pleasant. There’s a large bed with fluffy pillows and a silky white comforter, and a television set and two nightstands, plus, in a corner, a triangular board that serves as a table. I should set my laptop there, by the clean glasses and the bottle of red wine, but I prefer to write in bed. Propped by the pillows, I face the room’s one window. Through its square glass you can behold an endless spectacle. I see clouds, and I see a rocky shore and grayish waves, and far away, across the water, I see a dark mysterious promontory. But, after a couple of days, the sight I’ve come to love best is right under my window. Some twelve sheep of various sizes and colors quietly graze, play, rest, and sleep as only such placid creatures can. I keep watching them and taking their picture, which I post on Facebook. Who knows what terrible fate awaits my sheep in a world of human carnivores, but right now, as the sun finally begins to set, they seem happily oblivious to anything deadly. Grass is their habitat – grass, so green against the large gray clouds that, relentlessly, cover this town named Tórshavn. If you’ve never heard of Tórshavn, you’re not alone. I only found out about it a few weeks ago when I decided to visit the Faroe Islands and learned that its capital was named after the Nordic god of thunder, lightning, storms, and oak trees. There’s quite a bit to see in this small place: a cathedral whose interior is painted a vivid shade of blue; an art museum in a park; the harbor, where people sell and buy fish. Beyond this, the archipelago’s eighteen islands beckon with splendid visions. Truly, I have no words to describe mountains and valleys, brooks and coves, farmsteads and lighthouses – and the sheep, the sheep, virtually everywhere your eyes turn. It’s late spring, and evening approaches slowly in this boreal realm. The soft light turns gray and mauve, and I conjure up what remains invisible from my window, out there somewhere beyond the horizon. I imagine the multiple islands of the North Atlantic. Across the waves to the south is Britain, where I’m headed again soon, and south of there is the tiny island of Jersey, where I once spent a few hours, photographing cows and purchasing an old Bible. The Canary Islands, where my paternal grandfather’s family came from, are out there too, farther south, and then, sailing west across the wide Sargasso Sea, lie the blue and green Antilles. I picture the fragile Virgin Islands, whose towns – Christiansted, Frederiksted, Charlotte-Amalie – are named after Danish monarchs, who also ruled the islands I’m now visiting. East of there I see Puerto Rico, the happy colony of my childhood and teenage years; and mountainous Hispaniola, where my ancestors once lived; and Cuba, hermit republic, solitary star, where I was born. And to the north are the ancient Bahamas, which welcomed Columbus, and westward is the narrow, neon-lit isle where Miami Beach rises. And north of there I envision Caliban’s Bermuda, and Ishmael’s Nantucket, and the many islands of Maine’s Casco Bay, near which I spent some terribly icy winters. And even farther north is Newfoundland, the first place at which I landed upon leaving my birthplace, as we flew from Havana via Gander to Madrid, my first transatlantic journey of which I have no actual memories. And northeast of there, north of here, is lofty Iceland, whose language resembles that of the Faroe Islands. But where is this relentless circumnavigation taking me? Here and now, in this cozy abode in Thor’s harbor, I think of those travelers from the old family tree, those peripatetic Gués and Vidauds, Caignets and Trutiés, who left France for St-Domingue, and lived and loved in Santiago de Cuba and New Orleans and Philadelphia, and who then sailed back to old Europe, settling in Bordeaux and the French Pyrenees and Barcelona and Sitges, and who later, yet again, took off for the other side of the ocean, raising sons and daughters in Guantánamo and Brooklyn. Here and now, I think too of the men, women and children whom these ancestors enslaved, persons who had their own fathomless transoceanic adventures, people from whose forced labor I still benefit as I write these selfish lines. I don’t where I’m going with these ghosts, and I don’t know where this blog is taking me at this belated stage. Perhaps I’m just going in circles as I see the now foggy Atlantic through my window. It’s been almost six months since I last paid any attention to these Cuban Gauls. Ghostly figures, they are now perhaps even less real than before, as if my not thinking actively about them – fervently invoking them in this blog – were a renewed form of death. Some of you may recall “Averroës’ Search,” by Borges, the tale in which the narrator seeks to imagine an episode in the life of the medieval philosopher only to realize, sadly, the impossibility of capturing with words anyone about whom so little is known. At the end of the story, the narrator admits his failure, which leads to an incontestable vanishing act: “And just when I stop believing in him, Averroës disappears.” So too the Vidauds and the Gués of my story. I have so little to go by – an image here, a brief verbal account there, the sketchy family trees – that these elusive ancestors easily fade away. Last month, while in Paris for a couple of days, I meant to visit the grave of one of the old Vidauds at Montparnasse cemetery. But I lost interest. I only vaguely remembered who he was – a man who had held the title of the Comte du Dugnon in the second half of the nineteenth century – so, on that lovely summer afternoon, I ended up visiting the Musée Guimet instead. I was headed to Delhi and Hong Kong, and the rich and solid arts of Asia beckoned like no dead person could. The only ghost that threatened to appear to me in Paris was the Phantom of the Opera, about whom much was said on a tour of the Palais Garnier I took with a dear friend. Yet, I confess, hardly a day goes by that I don’t look at this tired blog. But my interest lies exclusively in the statistics page nicely provided by WordPress. I check out how many Visitors and Views I receive, and from what part of the world. Because I like flags, because a little side of me fancies itself quite cosmopolitan, I find it especially thrilling when I see the colors of a new country – Azerbaijan, Côte d’Ivoire, Slovenia – for the first time. What on earth did people there search for in Google that they ended up in the forsaken kingdom of someone else’s ancestors? As of today, people in 108 different countries have clicked on the blog at least once. From the beginning, though, most of my readers – if I can call them that – have come from just a few countries: the United States, above all, but also Canada and a handful of European countries: France, Spain, Italy, Germany and the United Kingdom. In the early years, a man in Haiti was a loyal reader and we exchanged several emails. Back then as well – and this has been the best part of all – I came in touch with a few other people who were also descendants of these same folks; as if following the example of the peripatetic Vidauds, they live on both sides of the Atlantic. Their contacting me has expanded my circle of kinfolk and my notion of family, making all this researching and writing absolutely worth my time and effort. Moreover, all of these new relatives have contributed stories and images that I previously ignored, greatly enriching the blog. They’ve impressed me with their talent for finding, say, a passport issued in Bordeaux in Year 9 of the French Republic, or deciphering the ancient squiggles of calligraphy in a birth certificate in the digital archives of the French Consulate of Santiago de Cuba. In the last few months, surely because of the absence of new posts, the number of Views has dwindled. It is not infrequent now that on any given day I may have just one or two clicks, or, alas, none – which makes it even more astounding that, recently, the number of Views from just one country has greatly multiplied. That country is France. There were thirty-one Views on 4 August 2017, forty-two on the 9th of the same month, 82 on the 13th, and, just when I thought they had gone away, twelve on the 23rd, just three days ago. Counting all other days, it adds to 210 Views in France so far this month, three times as many as from the United States and twelve other countries combined. Whether it is only one Visitor or more is hard to determine, as one person, I think, may be recorded as several people if multiple devices are employed in the reading. Besides this reader’s assiduousness, what intrigues me is that he or she (or they) appears to have read virtually all of my posts, and some of them over and over again. Curiouser and curiouser, this French reader – let’s assume it is just one person, and that he or she is indeed from France – has not directly contacted me in any way, which goes against my previous experience. My dear French Reader, pardon my lack of politesse, but what do you want? Are you simply interested in these old stories because they make such compelling summer reading (! ), or are you personally involved in the old family tales? Do you know or have something that may serve as a key to new episodes of “Our Ancestors the Cuban Gauls”? Would you come forward and tell me who you are? Or would you rather, as it is your right, remain as private as any other ghost? No matter what, Madam or Sir, please return and read on. You may think you may be done with your ancestors, but, once you’ve poked them in their resting places, they keep come back to haunt you when you least expect it. A few months after I had rather solemnly proclaimed the end of this blog — and, tacitly, of my interest in old ghosts, known and unknown — I received an email from a young woman in Barcelona who said she had found something I might be interested in. Her email read: “I went to a flea market today in Barcelona, Spain, and bought a painting of a man called Francisco Adelson Vidaud Gué. On the back it says he passed away 9 June 1886, in Villa de Guantánamo, Cuba. I just got the painting because I liked it and then I googled the name and ended up on your page.” Sure enough, this name coming out of the blue (my laptop’s blue screen) had to be one of our own, Adelson Vidaud. The origin of his peculiar name remained a mystery in the old family tree, but he was now about to materialize by means of a portrait found in a city well known to our ancestors. As the two or three faithful readers of this blog know, my forage into the genealogical woods has focused greatly on seven brothers and sisters born to a man from France and a woman from New Orleans who lived in the old province of Oriente, in eastern Cuba. One of the seven siblings, Alberto (or Albert) Vidaud Caignet, was my second great-grandfather, and he appears to have spent his life between Santiago de Cuba, the provincial capital, and La Reunión, a coffee and cacao farm whose sudden digital apparition one night prompted me to start this blog. Severo (or Sevère), his younger brother, was by contrast a bon vivant, a bachelor with an eye for women and a taste for the pleasures of travel. They had five sisters, the youngest of whom, Matilde, lived in Guantánamo and, like her two brothers, had several children, one of whom, known as Nunú, wrote a terrific account of family lore — a notebook drafted in Miami on which my own blog has drawn much. After the Revolution, many of the descendants of Alberto, Severo and Matilde left Cuba and now live in the United States as well as other countries. Two of their sisters, Carlota (an accomplished pianist who studied with Granados) and Magdalena, remained single, but yet two others, María and Juana Amelia, married Catalan men and, as Cuba obtained its independence from Spain; many of their descendants still live in Catalonia. We have reason to believe Carlota also resided with, or near, them, in Barcelona or perhaps Sitges. Mysterious Adelson was the uncle of these seven children. Could the newly found image have once belonged to Carlota, or María, or Juana Amelia? Its purchaser told me she had bought the portrait from an “old man” in a flea market in Barcelona’s Raval district — but what, exactly, was the painting’s provenance? Where was it created? For what purpose? What did it say about its subject? Could one attach any meaning to that peculiar long-haired physiognomy? What systems of fashion was this oval gentleman invoking when he donned a black coat and vest (were they velvet?) and a rather dandyish cravat? What about those blue pants? And what could one read in the man’s bluish eyes? 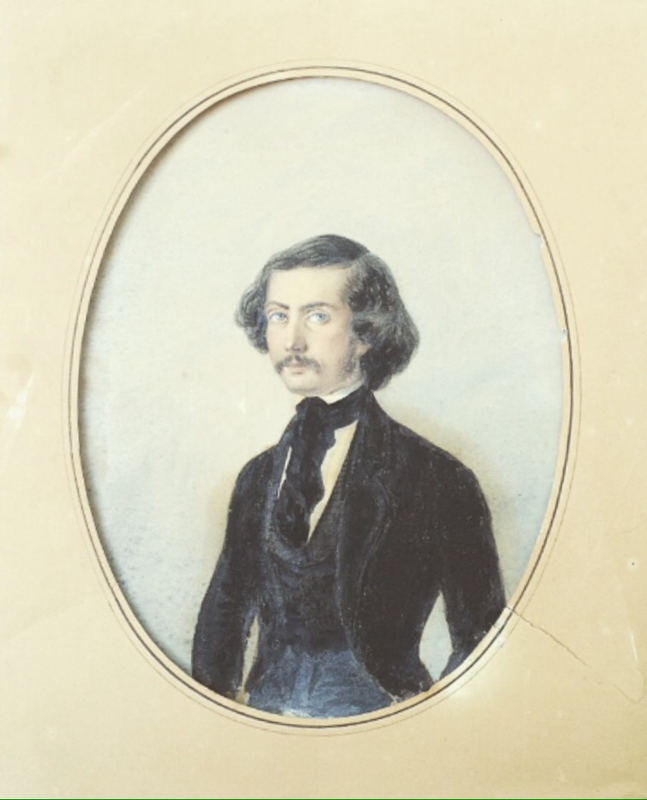 My dear readers, here he is, Adelson, who heretofore appeared in this blog as Adelson Vidaud du Dognon de Boischadaigne. Formerly just letters, he is now an image. But we still don’t know much about him. Let’s summarize what has already been recorded in this blog. His father was François Vidaud du Dognon de Boischadaigne, born at the Château de la Dourville, not far from Angoulême, in 1764; his mother, was Anne-Julienne Tardy, born in Cap-Français (present-day Cap-Haïtien) in 1780. The father left France during the Reign of Terror for Saint-Domingue; the mother, in turn, left the island apparently in the wake of slave rebellions. We don’t know when or where they met. In 1795, Aimée, as Anne-Julienne was known, married her first husband, Julien Tardy, in Philadelphia. I imagine that she ended up in Santiago de Cuba and met François there; we do know her eldest daughter was born there. But I can also imagine that she, like her siblings, ended up in Bordeaux and met her second husband there; his brothers, too, had returned to France. Whether Adelson and his brother, Adolphe, were born in France or Cuba is not altogether clear; there’s a baptism certificate that lists Adelson (or a man we think may have been Adelson) as a native of Santiago de Cuba, but Nunú, in her notebook, says both brothers were born in France. It probably doesn’t matter in the end. Like his father’s brothers and like his own nephews and nieces, Adelson must have had a transatlantic life that challenged any static notions of “old country” and “birthplace” and, perhaps, even “home.” Then again, if he had a home — a place that we can intrinsically associate him with — it had to be that coffee plantation (a euphemistic concept to which I shall return) next to that of a man named François Caignet, formerly of New Orleans, who had been active in the slave trade.This terrifying character had two daughters, Corinne and Charlotte, and they became the wives of Adelson and Adolphe, respectively. Fast forward to 1907, and lo and behold a faire-part announcing the death, in the city of Pau, of a French aristocrat, Pierre Paul Vidaud de Pomerait, the Comte du Dugnon, a distant relative of the Cuban Vidauds. Our Adelson is not listed among the mourners — alas, he too was dead! — but his four daughters are all solemnly enumerated. Two of these women were single, and two of them were married to Europeans: a Spanish military man, and a French diplomat. Could the portrait of Adelson have belonged to one of them? Surfing the web (which is the real subject of this blog), I have only found one mention of Adelson, or of someone with a name so similar that it must be him. From the 23rd to the 30th of September, 1878, at Paris’ Palais du Trocadéro, as part of the Exposition universelle internationale, there took place a Congrès international de géographie commerciale. As one can read in its “comptes rendus sténographiques,” published in book form and available online, participants came from all over the world, including now defunct entities such as Austria-Hungary, the Grand-Duchy of Hesse-Darmstadt, and the Empire of Brazil. Three men are listed under “Espagne (Colonies),” and one of them is “Adelson-Vidaud (J. ), propriétaire, à Santiago de Cuba”… Following Spanish practice and unveiling a first name previously unknown to us, Adelson Vidaud du Dognon de Boischadaigne can easily become Francisco Adelson Vidaud Gué — but how did he metamorphose into J. Adelson-Vidaud, if that’s who he was too? After we exchanged our first emails, the young woman in Barcelona graciously agreed to send me a photograph of Adelson’s portrait. When I received it, I happened to be in Stockholm. I mentioned this to her, and she replied that, despite her Spanish surname, she was actually from there. Such convergences! Last weekend I emailed her again, and she mentioned she was back in her hometown, where it is winter. I asked about Adelson — had he, our Caribbean traveler, remained near the Mediterranean, or traveled north with her to Baltic shores? She said, “The portrait is with me in Stockholm, and on show in my living room.” I may be magnifying this, but Adelson’s eyes, which even as I write this must be staring obliquely into a Scandinavian space, somehow mirror my grandmother’s cool gray glance. As a little girl at La Reunión, she may have met E.L. Ekman, the Swedish botanist, collector of some modest leaves that triggered this blog. But much of this, as you know, is mere speculation and self-regard. Here I am, in Boston, after a number of years. I’m reading a paper at a conference at Harvard, so even though I’m staying at a hotel on Tremont Street, much of my time is spent across the Charles River in Cambridge. I did my graduate studies at the university, and I know the place as intimately as a student can. But time hasn’t stopped still — not at Harvard. My old haunts are still there, but there are several new modern buildings, and even the old ones have been transformed. The old Fogg Museum, an Italianate structure from the 1920s among whose paintings and sculptures I always felt at home, has been renovated and expanded by Renzo Piano. Gathering items from two other art collections, the place is now known as the Harvard Art Museums. Transparent, grand and intimate, it feels to me like the happiest place on earth. But I digress. On Thursday — which happened to be St. Patrick’s Day and the conference’s first — I had to attend an event at a new handsome structure with the rather Hitchcockian name of Northwest Building. I knew it wasn’t far from Richards Hall, the Gropius-designed graduate dorm where I once lived, so I resorted to Google Maps, hardly expecting what I found. Close to the digital marking of the said building, a rectangle popped up on the tiny bright screen elegantly marked as the Harvard University Herbaria. It was located at the northernmost end of Divinity Avenue, a place I was familiar with from my first semester at the university, when, a budding and soon-to-be fading scholar of medieval Spain, I took a course in advanced classical Arabic at the Semitic Museum. But I digress, yet again. Faithful readers of this blog may recall its origin well over a year ago in yet another act of serendipitous googling. Searching for the coffee and cacao farm in Oriente province where my grandmother had spent her childhood, I had typed in La Reunión and an image come up. It pictured a few modest leaves and twigs collected in those distant hills, purportedly belonging to my second great-grandfather, by E.L. Ekman, a Swedish botanist, in 1916. They were specimens of the Eugenia oxysepala Urb. — tiny and modest, perhaps, but a direct link to a mythical location in the lore of my French-Cuban ancestors. The image, as I now remembered, also showed an oval seal of the Herbarium of Harvard’s Arnold Arboretum. Did that mean, then, that they were across the river in Boston, where the Arboretum is located — or could they, perhaps, be housed right there on the Harvard campus? Would I be able to find their actual location and perhaps even see them in all their botanical atemporality? I decided to investigate. On Friday just before noon, finding myself again not far from Divinity Avenue, I crossed the threshold of the Harvard Herbaria. At the reception desk, a silver-haired woman greeted me with friendly efficiency and perhaps a measure of curiosity. It didn’t seem they were used to many impromptu visitors. When I awkwardly explained what I wanted, showing her a picture of Ekman’s specimen on my iPhone, she immediately went in search of a curator who might be able to help me. After a few minutes she came back with a dark-haired man. He too turned out to be intelligent and sympathetic and invited me to his office, where he consulted his computer for a few minutes. It indicated the leaves and twigs were housed in the very building we were in. The search then entered the very real world of the actual collections. We climbed stairs and traversed long corridors on several floors, lined with endless rows of enormous, hermetically sealed cabinets, labeled with botanical terms such as Melastomateaceae and Astronidium and geographical appellations such as Mexico and C. Am., South America, Australia, Polynesia… After a couple of false starts, we finally found what we wanted. 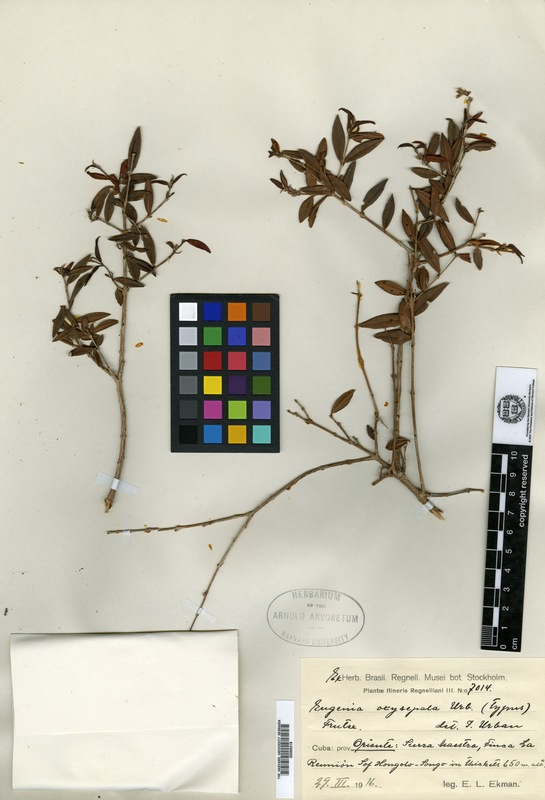 From a cabinet that read Myrtaceae, Calypranthes and West Indies, the curator extracted a large red file and took it to a table, where he then proceeded to reveal its contents. There they were, those beautiful leaves and twigs, our precious Eugenias gathered at La Reunión one-hundred years ago, neatly preserved at the Harvard Herbaria, as if waiting for me to show up one cold Friday afternoon in the very late winter of 2016 to see them. And here you can see them, once again in digital form. But I saw the real thing, lovingly cared for by men and women devoted to the arts of botany. And there they must have been too, in the flesh, back in September 1982, when I had just arrived on campus and walked for the first time to my Arabic class, a few hundred feet away in the Semitic Museum. If only I had known of their existence back then, when I was a stranger in a new place, one student among many. I remember my sense of alienation that afternoon. In a small seminar room to which I had finally come after crossing several rooms full of inscriptions and sarcophagi, sitting right across the table from me, there was another student. As we all waited for the professor to arrive, she was speaking with another student. I detected a foreign accent. Not without timidity, I asked her where she was from and she said she was from Cuba. That was the short version of her provenance, as she had previously lived in Mexico, Switzerland and Venezuela, and, as a doctoral student in the history of Islamic architecture, had traveled through much of North Africa and the Middle East… Now that I think about it, my little leaves too, like María Luisa, had probably traveled far and wide. After all, Ekman was Swedish and the specimens in front of me featured, just below the seal of the Harvard Herbaria, a label that read “Musei bot. Stockholm,” a passport stamp of sorts that suggested a Scandinavian sojourn before a transfer back across the Atlantic to the so-called New World. After patiently allowing me to take all the pictures of Eugenia oxysepala Urb. that I wanted, the dark-haired botanist asked me if I was interested in seeing what the envelope contained. I was a little surprised, as I hadn’t really paid much attention to the small pocket-like thing, discreetly devoid of colors and words, neatly tucked in the lower right corner of the red file. I said yes, of course. Delicately, he unfolded the fragile white paper thing, revealing a tightly packed collection of tiny desiccated leaves. I don’t know for sure, but they appeared to have remained airless and unseen for many years — modest exiles from the tropics, silently abiding in the company of other such exiles from far-flung provinces of the vegetable kingdom in a well-secured site in these United States. The botanist looked relieved and smiled when I said I wouldn’t run my fingers through them, or throw them in the air, even if such actions appeared tempting. I was overjoyed by the unexpected apparition — my fellow migrants, sad confetti from another world. But all I could do was to take their picture and replant them here on the soil of the digital forest, knowing their story will continue to grow. From the onset of this botanical expedition in search of the elusive family tree, I have been tempted by the idea of uprooting it all. My genealogical findings, such as they are, often strike me as embarrassing and ultimately meaningless, so why continue? Now that our visit to Israel and Palestine has left me in a biblical stay of mind, I think it makes sense to end it all right here, on the fortieth post. Just over two weeks ago we were in Jericho, of trumpet-fame, and took a cable car up to the opulent Greek Orthodox monastery built on the slopes of the Mount of Temptation. That otherwise desolate peak is reputedly the “exceeding high mountain” where the devil took Jesus after his forty days and forty nights of fasting in the Judaean desert. From there, as Matthew tells it, the devil “showed Him all the kingdoms of the world and the glory of them, and said unto Him, ‘All these things will I give Thee if Thou wilt fall down and worship me.’” Such fabulous words, especially in Latin: “Haec omnia tibi dabo…” Any way, basta. I have been worshipping at this blog’s feet for too long. I have been fortunate to have had a glimpse into the kingdoms of the past — so distant and immutable, so elegant at times, but also so cruel and terrifying. But I must now return to a present where other kinds of writing beckon me. Many questions remain about my Cuban Gauls, but the central one concerns the life of François Vidaud du Dognon de Boischadaigne, Nº 7, who may well have been the first of our French ancestors to arrive in Cuba. We have his baptism certificate, found by one of my Miami genealogist cousins, which shows he was born in 1764 in Aubeville, site of the family’s ancestral Château de la Dourville (which, incidentally, yet another Miami cousin recently visited). We know that François, along with four of his brothers, left France for Saint-Domingue during the Reign of Terror. We also know that some of those brothers, including a saintly priest (François Nº 11, the Abbé Vidaud), returned to France via Philadelphia. But we don’t really know much about François’ ultimate destiny, except that he married a woman named Anne-Julienne Gué, who was the daughter of Jean-Baptiste Gué, an architect killed during a slave revolt in Saint-Domingue, and the sister of Julien-Michel Gué, the artist whom I love and who achieved a measure of fame in France. When and where the marriage of François and Anne-Julienne took place remains a mystery. She had been married before (to a man named Julien Tardy) and they had a daughter, Anne-Joséphine, born in Santiago de Cuba at the turn of the nineteenth century. To complicate matters for her genealogist descendants, Anne-Joséphine in turn married one of François’ nephews, Pierre, whose father, the Seigneur de Pomerait, was also named Pierre… François and Anne-Julienne had two sons of their own, and what documents we have, such as birth and baptism certificates for their children and grandchildren, appear to indicate that those boys, Adolphe and Adelson, were born in France. How they ended up in Cuba — if, in fact, they were born on the other side of the Atlantic — is, again, unknown to us. In a book on the French who settled in Santiago de Cuba after the French and Haitian revolutions, by Agnès Regnault, there’s a footnote in which a man named François Videau is described in passing as an “ancien réfugié bien connu par ses activités corsaires.” The note concerns mostly Pierre (the father, the son, a composite figure? ), and there’s some other information therein that doesn’t quite fit what we know (who are Louis, François and Pierre-Julien, named as his children? ), but I’m tantalized by the prospect that our François might have been a corsair of the Caribbean. If this turns out to be true, I believe I will be tempted to return to this blog forthwith. A quick visit to the Archivo Histórico Provincial de Santiago de Cuba might shed some light on the matter. The mysteries that still remain are to some extent visual. Consider, for instance, this image of two little ancient boys. Who are they? The photograph belongs to my dearest cousin, Mari of Maryland, and we agree they might be our grandmother’s older and younger brothers, Manuel and Fernando de Granda Vidaud. We think it might be them because we have another photograph — of Carmela, our grandmother, and her older sister, María — that somehow resembles this one, which suggests that they are companion pictures, perhaps taken on the same day, in 1912, by the same photographer in Santiago de Cuba: the boys with the boys, the girls with the girls. We have other photos of Manuel and Fernando as young men, including a family portrait in which they appear with the rest of the entire de Granda-Vidaud clan — both parents and all seven siblings. We also know aspects of their biographies, and I even knew Fernando in person when, in his seventies, he spent the last years of exile in Massachusetts. But is that you, Fernando, that little boy? Whoever you may be, little boy, you really look a lot like my mother when she was a little girl — and my sister and my niece too. Then again, what meaning should one attach to these resemblances, these aires de familia? What is the significance, really, of visibly sharing genes across space and time? There is a much larger challenge, one which a novelist might be able to tackle far more interestingly than anyone else. We can look at the figures in the photographs, we can even know who they are, yet their minds, or souls, are bound to be not transparent. Consider a photograph of two women, posing together in some distant belle époque salon in what is probably Pau around 1910. (A copy of that photograph is in my possession, but I dare not post it as its provenance is labyrinthine.) There’s a lady sitting down and her name is Marie Joséphine Vidaud du Dognon de Pomerait. She is the sister of Étienne Octave V. du D. de P., who settled in Brooklyn in the 1850s, but we have a few facts about her own life too. In his invaluable genealogy, M. Vallantin Dulac tells us she was born in Santiago de Cuba around 1841 and died in Pau on 30 July 1916 — two years before her son, Henri Pierre Lafont, a general and military attaché, died in Romania at the end of the Great War. On 10 February 1864, in Santiago, Marie Joséphine married a medical doctor named Jean Henri Lafont, who had been born in Orthez, in the Pyrénées-Atlantiques, and migrated to Cuba. I don’t know what prompted the man to migrate to the distant Spanish colony in the Antilles (a brother who was a merchant there, as a birth certificate suggests?) or what triggered his eventual return to France (the Ten-Year War? ), but everything seems to indicate that settling down in Pau, not far from his birthplace, was a good decision. After what appears to have been a distinguished medical career, Jean Henri died in that city in 1905, eleven years before his wife. The second lady in the invisible picture stands rather solemnly behind the sitting figure, and her name is Marie Lucie Philomène Lafont. She is Marie Joséphine and Jean Henri’s youngest daughter. As I read on the web,she too was born in Santiago de Cuba, in 1871, and died in 1946 at the age of seventy-five in Artix, a village also located in the Pyrénées-Atlantiques. I don’t know much about her, except that one of her descendants in France was a stupendous genealogist who was in touch with some of my cousins until his recent death. But for me the real enigma is a little girl portrayed in the picture — a photograph, a painting? — on the back wall. Who is she? Might she too be a distant relative? I’m tempted to say she may be one of Marie Lafont’s two daughters. Both of them, incidentally, boasted long names that delight me. Could our little girl be Marie Thérèse Solange Luce Flye Sainte-Marie, born in 1901, or Marie Louise Joséphine Odile Flye Sainte-Marie, born in 1903? Let’s imagine, as I suggested, that the photograph of Marie Joséphine and Marie Lucie Philomène was taken around 1910. Let’s imagine too, at least for a moment, that the image of the little girl is one of Marie Joséphine’s granddaughters. Let’s imagine who her transatlantic cousins might be. Back in Cuba, around the same time, my grandmother was also a little girl, living with her grandparents on a coffee and cacao plantation known as La Reunión, somewhere in Oriente province not far from Santiago de Cuba. It’s always difficult to imagine one’s elders as young children, but let’s try. As I embarked on the writing of this blog, I made every possible effort to imagine my grandmother, Carmela, as a child at La Reunión. It was 1916, the height of the Great War, and a Swedish botanist named E.L. Ekman visited those fertile hills in search of specimens. My grandmother’s grandfather, I imagine, welcomed the botanist to the house and they spoke, most probably in French, about plants and the war in Europe and — yes, why not? — the splendor of Cuba, a new republic. None of this, I’m afraid, really happened, but does it matter? Years passed, many years, and a revolution took place and my grandmother left her beloved land and went into Exile. Many more years passed. And then, at the age of 95, in last days of November 2000, Carmela became sick. I was about to go on a trip, but I made a point of calling her before my departure. Sitting on the gray carpet of my apartment in Los Angeles, I heard her voice from San Juan de Puerto Rico. She, who always had spoken so assertively, could be heard now just faintly, spectrally. I wasn’t sure she knew who I was, which shocked me even as it alerted me to the fact that we were saying good-bye. Two days later I was in Rome and the telephone rang early in the morning. It was my sister to tell me that Carmela, who had so often seemed immortal, had just died. Carmen Luisa Nicolasa de Granda Vidaud, who emphatically defined herself as “católica, apostólica, romana,” would probably have liked the fact that, as she lay dying, one of her grandchildren was just a stone’s throw from St. Peter’s. My travel companion and I had planned a daytrip to the Amalfi coast, and he suggested we cancel it. We still went; I insisted that being sad right then and there made no sense. The picture you see here is me, smiling, even though it was a cold and gray day in Positano, even though just a few hours earlier, on the other side of the Atlantic, my dear grandmother had turned into a ghost. The next day I happened to be near Santa Maria sopra Minerva, behind the Pantheon; there, among the old gods and by the tomb of Fra Angelico, I lit a candle to honor my dead souls. Let’s redeem my image by imagining it now as the visual signature of this fortieth post and a belated act of mourning. The specimens that Ekman collected at La Reunión made their way to the Harvard Herbaria and there they still sit. One sleepless night fifteen months ago I found a picture of those same leaves, the Eugenia oxysepala Urb., on the web. The digital image of the those remnants and the lovely botanical label below describing them prompted the writing of this strange blog. But this too must come to a close. In the beginning was a Plant, and there is also one at the end. But let it be the smiling Christmas tree standing in our living room, full of lights and redolent of life. Before we too become ghosts, as we certainly shall one day, let’s imagine ourselves as everlasting souls living together forever in some glorious kingdom of the mind. We’re in Zürich for a few days on our way back to Los Angeles. I’ve been here before a few times — twice as a researcher and writer for travel guidebooks — so it’s not a city I view as alien to me. In fact, despite its apparent bourgeois smugness — the flawless national and cantonal flags everywhere, the opulence of the shops on the immutable Bahnhofstrasse, the blue trams silently gliding along as if the streets were made of soft Alpine waters — it is a city I’ve always liked since my first visit at the age of sixteen. Then, if not now, it struck me, a child of the wild Americas, as the epitome of European charm and order. But never before had I been to the Villa Wesendonck, pictured here. Built as a private residence, it is now the site of the outstanding Museum Rietberg, devoted to the arts of Asia and other parts of the world. In the late 1850s, the villa and the surrounding park served as the setting for Richard Wagner’s liaison with the poet Mathilde Wesendonck. Her husband, Otto, a wealthy industrialist, had extended Wagner and his wife an invitation to stay in a cottage — the Villa Schönberg — on the villa’s grounds, and Wagner, eternal fugitive, had gladly accepted. He named it his “Asyl,” and there, in the peaceful land of Switzerland and with the hospitality of a generous patron, the great composer began to work on Tristan und Isolde. We ignore the exact nature of Richard Wagner and Mathilde Wesendock’s friendship, but we at least have the passionate Wesendonck Lieder, in which he set to music five of her poems. In the text of the second song, “Stehe still,” she writes: “So I, in sweet oblivion, / May take full measure of my joy; / See bliss within another’s eyes, / Immerse my soul within another’s, / Another’s being that mirrors mine; / An intimation that hope’s goal is near.” The poem, of course, is better in the German original, but even this awkward version still conveys the amorous loftiness that may have in the hearts of Richard Wagner and Mathilde Wesendonck, who dwelled near each other in a peaceful villa not far from a quiet lake in the middle of the nineteenth century. In this city in the heart of Europe, just about to return home, I’ve been thinking of my own Vidauds, the subject of this laborious blog. Some of the most interesting among them were also born and lived in those remote decades. Some crossed the Atlantic many times. Some, like Wagner and Wesendonck, must surely have loved other bodies and minds. And then I despair at coldness of my treatment of their spectral lives. How can I even think of retrieving them for the past without being able to know their hearts? Should I simply discard this silly little blog and imagine them — Adolphe, Charlotte, María, Alberto, Severo, Fanny, even the older Anne-Julienne and Julien Michel, plus the elusive François V. du D. de B. — not as silly little names stuck in the twigs of the family tree, but as full-blown figures who may live again in the realm of fiction? As I approach the biblically sounding fortieth post, it may well be time for to put an end to this relentlessly equivocal botany — to turn, as it were, a new leaf — and write a novel, where truth resides. A brief sojourn in Jerusalem. I’d never been here before, but I’m not the first descendant of Adolphe Vidaud du Dognon de Boischadaigne to have made his way to the holy city. (More on that pilgrim in a minute.) Jim and I arrived in Tel Aviv, our first stop, on the first day of Chanukah — a fortunate coincidence that allowed us to eat at least one of the traditional jelly doughnuts almost every day, and participate in the ritual lighting of the menorah on two different evenings at our hotels — a wonderfully renovated Bauhaus edifice on Tel Aviv’s Boulevard Rothschild, and a mansion from the British-mandate era in Jerusalem’s German Colony. We put on our skullcaps and, guided by our kind hosts, pronounced some Hebrew words, including “Amen,” and even lit some candles. It felt lovely to me, a non-Jew, because of the intimate strangeness of it all, and because the holiday seems so mellow compared to the frenzied spirit of Christmas in the United States. A non-Christian, I nevertheless enjoyed seeing some of the places linked to the religion I grew up with — from the childlike Church of the Nativity in Bethlehem, which was part of a tour around Palestine we took last Saturday, to the lugubrious Church of the Holy Sepulcher in Jerusalem’s Old City. There, in a cavelike enclosure, I stood in the sole company of a nun kneeling by the silent grave from which Jesus is said to have resurrected. And just this morning, very early, I made my way up to the otherworldly Dome of the Rock, from which Mohammed ascended to heaven. It was cold and windy and few people were there — just a small group of American tourists, plus other visitors of indeterminate provenance escorted by men carrying machine guns. It was somewhat disconcerting when a group of young men, custodians of the splendid golden dome, began loudly and relentlessly to recite “Allahu akbar!” A non-Muslim, I wasn’t sure how to read those famous words in that particular setting. The skies had turned gray and it had started to rain. Jesus famously proclaimed that his kingdom was not of this world; my Jerusalem, by contrast, is emphatically terrestrial. After taking numerous selfies, guided by Google Maps, I threaded my way in the cold rain — an unexpected baptism of sorts, as I had no umbrella — to the Via Dolorosa. There, where Jesus purportedly suffered his agony, I felt virtually nothing. Yet I recalled with pleasure the Hebrew inflections of one of our Jerusalem guides, Paul, a handsome young man from Tel Aviv — his protracted pronunciation of Dologhrohza — and I relished the orientalist proclivities of the an ancient-looking advertisement placed above the trilingual street sign: “Hamedian Gallery / Specialized in old Russian icons / old Oriental carpets, old jewellery / & antiques / Via Dolorosa 36.” I remembered too our tour of Palestine on Saturday. After stops in Ramallah and Jericho, we were taken to the very spot on the Jordan River where John baptized Jesus. Wearing white robes, pilgrims from Nigeria immersed themselves in the muddy waters, just a few feet from the country of Jordan, on the other bank. There too, according to my mother, Alberto Vidaud Centeno, my grandmother’s cousin whom everyone knew as Bebé, had once donned a white robe and happily walked into the river to commemorate his Christian faith. He was a religious man, but he was also an indefatigable traveler who loved our vast mysterious planet. Many years before me, pious and curious Bebé had surely wandered in the same streets of the Old City where I now walked. If there’s a heaven, there’s no doubt in my mind Bebé is there. Regardless, blessed are the adventurous, for theirs is the kingdom of this world.